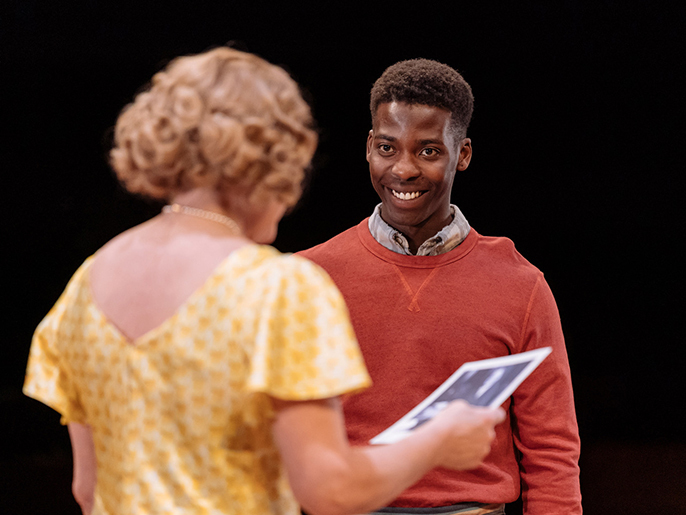 Afridiziak Theatre News caught up with rising star, Jyuddah Jaymes, who is currently performing in world renowned playwright, Arthur Miller’s The American Clock on at the Old Vic. The American Clock opened in February, how is the show going? This has been an intense process and happily the show has been received well. It has been great to be at the Old Vic doing this show, a surreal experience with its own ups and downs but we’ve all been tight as a team which has kept us together and got us through it and allowed us to be able to tell a good story which has kept the fire alive. Circumstance and time - not having enough time has been the hugest thing. When we initially started rehearsals we had a lot of things kick off, nothing dramatic just random things that took us by surprise so by the time we got into the space at the Old Vic we had a lot to do and there was a lot of fatigue throughout the cast and crew. We have stuck at it and for the sake of what we have created we have not let fatigue or tiredness get us down. But every show has something like that. It’s part of the process of creating something like this. The first is my most principle character, Lee, who is the son of the Baum family and he appears throughout the whole story. Some people say that Arthur Miller wrote him as an autobiographical character reflecting his own life as he saw his family go through the Great Depression and how it affected him. How do you keep yourself energised - physically and mentally? I never used to have any regimen until recently I’ve gone back to the gym. The show is intense and a lot of us have lost weight unintentionally. My girlfriend keeps telling me about how much weight I’ve lost and I’m like I didn’t mean to it just happened. So now I’m back in the gym and I am eating A LOT! Like loads of food, good food though not too much junk. I make sure I stretch for at least 25 minutes every day, which has really helped to decrease stress and tension in my body. That’s a good tip for people. People need to focus on stretching their bodies and releasing tension, especially if you sit behind a desk or are driving all day. Stretch! Also, I’ve learnt how to switch off completely once I’m away from work. Any moment that I can get to do nothing I fully relax, not thinking about work or what I have to do the next day. Just chill. You play several different roles in American Clock, tell us more about them? The first is my most principle character, Lee, who is the son of the Baum family and he appears throughout the whole story. Some people say that Arthur Miller wrote him as an autobiographical character reflecting his own life as he saw his family go through the Great Depression and how it affected him. Lee starts off as very innocent and carefree, he’s just a kid and we see him go through the first eight years of his life being very wealthy to having not much at all. Then you have Joe who is Lee’s childhood friend, they grow up in the same area. It sounds strange but there are several different actors playing Lee throughout the play and so when I’m being Joe somebody else is playing Lee, it sounds complex but if you see the show it will make sense. There are three different races playing the Baum family throughout the show so race can be very fluid but with Joe he is definitely, and unchangeably African American. You can see it in his walk, his talk, his mannerisms – he is a black man. Then I play Mr Graham who only appears in one scene. He is a reporter who is trying to find out the real deal on another character called Theodore K Quinn the tap dancing business man in charge of General Electric. Its so funny trying to explain this show outside of the show but if you see it makes sense. For anybody who has not seen it please come and catch it then everything I’m trying to describe will click into place. How did you prepare for the characters and your American accent? I actually thought you were American at one stage! Ha (We both laugh) I will take that, that is a huge compliment. I actually auditioned with that accent, I thought I could get away with it. We had an amazing vocal and accent coach, Penny Dyer. Penny really broke it down and we had lots of different sessions working on our accents it was very detailed. I asked our director, Rachel Chavkin (sic) what she wanted, and I was asked to do three different accents for each character so I couldn’t have a generic accent. I really wanted to have fun with the characters and jump in with a guise under what Rachel has given us to work with. I just kept practicing. I also watched a lot of American TV growing up so getting the nuance of each accent was where I started from and built up. Ninety-five per cent of actors do not make loads of money and do this purely out of love for the craft. The chance of making loads of money is small but this career is rewarding especially when you get to be in great roles and work with different people. For yourself what attracted you to acting? I don’t even know. If I’m honest I think when I was younger I loved impersonating people, I loved the idea that you could pretend to be someone else. It was always my escape. For years I held off on the idea of taking acting seriously, but I was always acting a little bit. I’d convinced myself that I could do acting but not as a career or make money out of it. That’s a huge thing, a big challenge. If any actor gets in to acting thinking they are going to make money that is a big mistake. Ninety-five per cent of actors do not make loads of money and do this purely out of love for the craft. The chance of making loads of money is small but this career is rewarding especially when you get to be in great roles and work with different people. 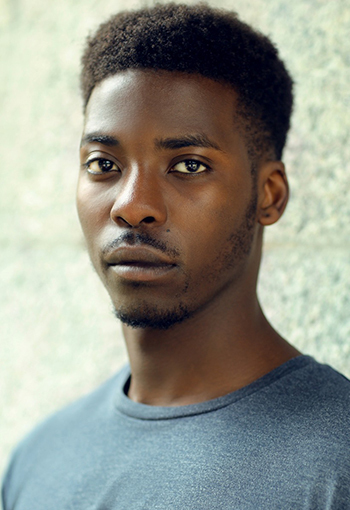 At 17 I was part of a group called The Television Workshop in Nottingham which is a really great group for young actors and I joined for some years then left to go to drama school, Bristol Old Vic Theatre School, when I decided that I really wanted to be an actor for real. 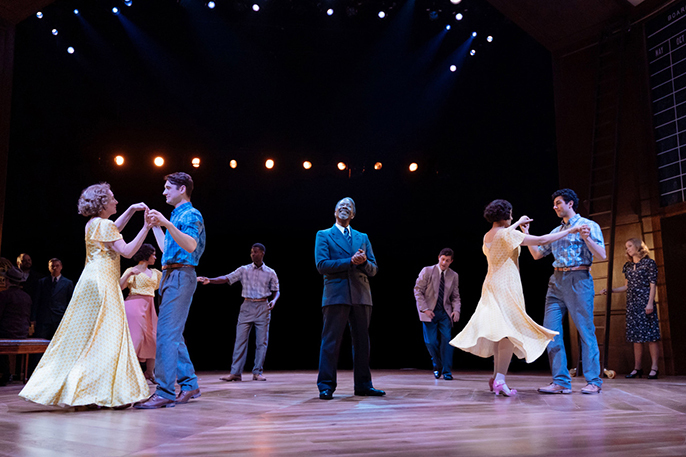 What have you enjoyed most about this experience at the Old Vic? To get a chance to be a principal character in an Arthur Miller play is the sort of work that keeps me going. It’s the excitenment…wait that’s a new word! Lets keep it. Yes the #excitenment of this type of play that makes it worthwhile. You were in BBC drama Clique Season 2, playing a new character Aubrey. How was that experience and do you prefer TV or stage? For Clique I had recently signed with my agent and I got a message on the Friday to do a video audition, a self-tape, and got a call back on the Monday. I got a call and headed down to London to do the recall and the next day they offered the role to me and it was an amazing experience. Really a great time. I think someone else was meant for the role but things changed and so it was opened up again and they needed someone really quickly so that was a great opportunity for me. I’m not 100% sure if that’s the true story but it worked out great for me! The character was so extra and so extravagant and there were some scenes that I was like to do we want to watch that back did I overdo it?? I didn’t want to go in half-heartedly, Aubrey’s character was full of energy and wanted to have fun so I fully went for it. The BBC are really supportive and I’m so glad that I had that experience. I make sure I stretch for at least 25 minutes every day, which has really helped to decrease stress and tension in my body. That’s a good tip for people. People need to focus on stretching their bodies and releasing tension, especially if you sit behind a desk or are driving all day. Stretch! To answer the TV or theatre question, well if I’m honest given my initial intro to theatre and TV, I enjoy the prospect of doing more TV. Mainly because of the intimacy of it, which may surprise some people, but I want you to imagine doing a scene with just two people in that moment a real one on one conversation. They can whisper look each other in the eye and the smallest gesture or expressions can be captured. Whereas on stage you have to lift your voice and everything has to be larger, which is a marvellous technique to learn and some actors are so amazing at this and can be absolutely electrifying onstage, it is absolutely amazing what they can produce. But I always used to battle with my voice teachers at school as I was always the one asking ‘Why is that person shouting that’s not how they speak in real life?’ I get it now after being onstage, but for me the closer I can get to real life the better it is for me and I think TV gives you a way into that. I don’t know. I’m auditioning and seeing where things go but I’m not stressing. Last year I was constantly searching and hunting for new opportunities and they came to me one after the other so I feel really blessed. This year I feel more relaxed so I may take a break. Working at the Old Vic on this play is going really well and I’m just focused on the present time and I know that there will be something round the corner.